In the pre-dawn hours on Friday, the annual Lyrid Meteor Shower returns to Bay Area skies, offering what can be a breathtaking celestial light show for those willing to trade in a little sleep time. The Lyrid meteors are active from around April 16th to the 25th, but the peak in their activity usually lasts less than a day. This year, greatest activity is expected to take place on the morning of Friday, April 22nd, sometime before dawn. The best viewing is generally around 3:00 a.m., but you can expect to glimpse meteors anytime between midnight and dawn. Lyrid meteors will appear to emanate from a point in the sky (the shower's "radiant point") near the constellation Lyra (hence the name "Lyrids"). 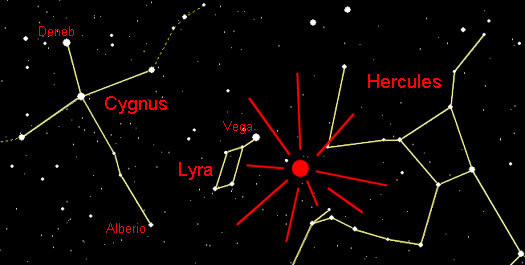 Lyra rises in the northeast in the late evening, and is marked by the bright star Vega. By 3:00 a.m., Vega and the rest of Lyra will be high in the eastern sky. Wherever you end up watching from, make sure you have an unobstructed view of the eastern sky. The light of the nearly full moon will interfere with viewing this year, drowning out the fainter meteors in the shower, but the brighter meteors should still be visible. Fortunately, by 3:00 a.m. the moon will be in the southwest and hence behind you if you are looking eastward toward the Lyrids' radiant point. As long as you have a clear sky you can hope to see a Lyrid meteor from your own backyard — but to increase your chances, it helps to get as far away from city light pollution as possible. Fortunately, even though the San Francisco Bay Area is a major metropolitan area, the geography of surrounding mountain ranges creates a number of "dark spots" that may be less than half an hour's drive from your home, depending on where you live. In the North Bay there are plenty of dark choices, from the coastal hills out toward Bodega and Point Reyes (though beware of the marine fog forecast), to Sonoma Mountain east of Rohnert Park and Cotati, to the Napa Valley. In the East Bay some of the glare from Berkeley, Oakland, San Leandro, and Hayward is blocked by the East Bay Hills, offering shelter from some light pollution. The ridgeline (Skyline Blvd., Grizzly Peak Blvd.) should be okay, but moving east gets you farther from the source of major light pollution on the Bay side. The slopes of Mount Diablo offer a good view, and one far from the coast. Though the gate of Mount Diablo State Park closes at sunset, on the road below the gate there are pullouts to be found. The Sunol area is also a good East Bay choice, protected by hills on all sides. Farther south, east of Morgan Hill, is Henry Coe State Park, an ideal spot for meteor viewing for several reasons. It's away from the coast and major urban centers, and the park gates are open around the clock. On the peninsula south of San Mateo, on Skyline Blvd., there are a few good spots to pull over and give the meteor watching a go. Wherever you choose to view the Lyrids from, stay safe, of course don't park where you aren't supposed to, and make sure you're not trespassing on private property. A meteor — also called a shooting star -- is a tiny bit of metal or rock, usually no bigger than a fingernail, that burns up in Earth's atmosphere. 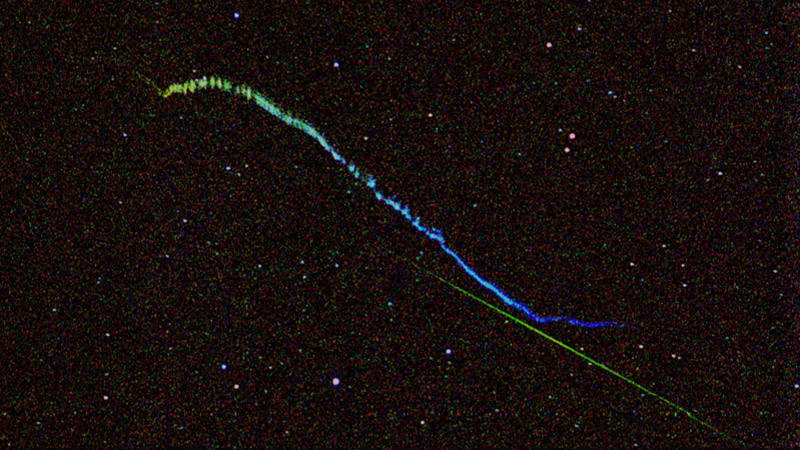 A single meteor can be seen at any time of the year when a rogue bit of material flying around the solar system enters Earth's atmosphere at random. Meteor showers occur when a cloud of dust strikes our atmosphere around the same time — or more accurately, when the Earth passes through a trail of dust left behind by a comet. The side of the Earth that faces into the dust cloud as Earth moves through it happens to be under morning skies, which is why you can only see a meteor shower between midnight and dawn. It's a little like when a car, speeding down a freeway, passes through a swarm of flying insects, which strike the windshield of the car and not the rear window, leaving splats and streaks on the front end. As comets pass close to the sun they warm up and some of their ices are vaporized, forming the comet's familiar tail. The vapors carry dust and leave behind a trail of particles. 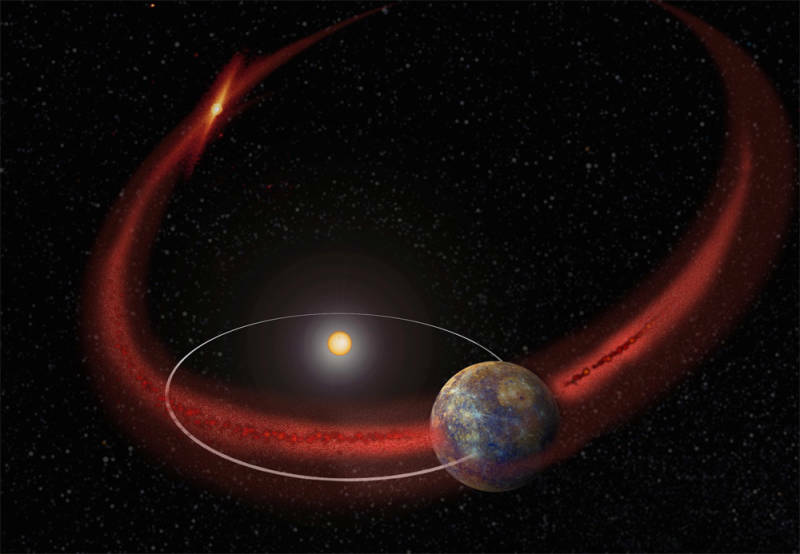 When Earth slams into the dust trail at its orbital velocity of 18 miles per second, the dust particles burn up in our atmosphere and vaporize. The Lyrid meteor shower is one of the oldest known, with some observational records dating back 2,700 years. 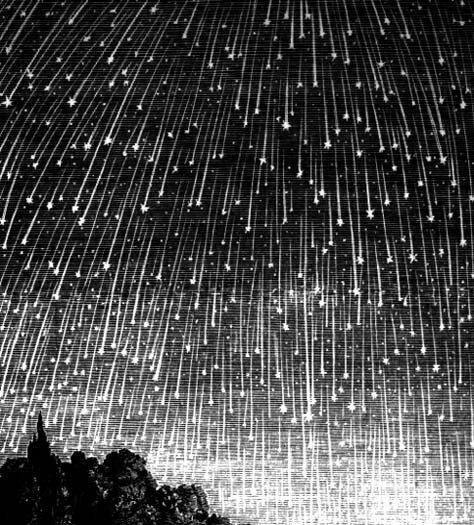 A record from China described the meteors of the Lyrid shower of 687 BCE as "falling like rain." Each meteor shower originates from the dusty leavings of a different comet. The comet responsible for the Lyrids is named C/1861 G1 Thatcher. We have no photographs of Thatcher since it last passed through our part of the solar system in 1861, on an orbit that takes 415 years to complete — so this comet won't come close again until the year 2276. But the legacy of comet Thatcher's visit — the trail of dust it left behind — still lights up our skies every year.